A month ago I ran a seven-day sale on my novel KILLER INSTINCTS, reducing the price from $5.99 to $0.99. I promoted the book through three different eBook sales mailing lists: BookGorilla, The Fussy Librarian, and eBookSoda. All three emails went out on the same day - Sunday, May 29th. The book was listed as a "Thriller" in terms of category, one of the largest population bases in terms of the subscribers of these mailing lists, meaning the book likely found its way into a couple hundred thousand email inboxes. KILLER INSTINCTS, despite being one of my better-reviewed novels, just doesn't sell well. In the twelve months before the sale, I'd only managed to sell 28 copies, along with a few thousand Kindle Unlimited page reads, probably amounting to another half-dozen or so "sales" of the book. I was curious as to how well the new cover would affect sales, since I'd just put it on the book a few weeks prior, without any appreciable rise in sales. Below, I've provided the KDP sales chart for the whole month of May, through to today (June 27th). 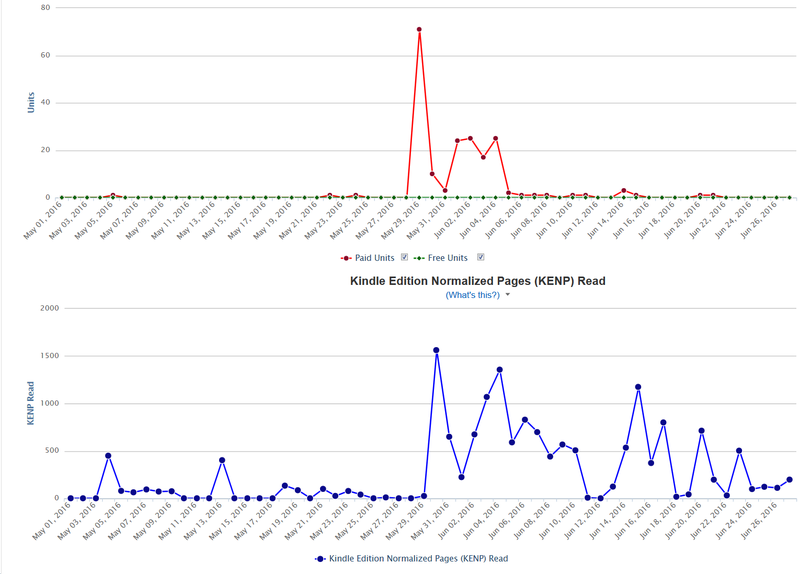 The top chart is sales, the bottom chart is Kindle Unlimited page reads. All told, between today and May 29th, I sold 187 copies of the book, only 13 of which were after the sales period. While those 13 extra sales were nice, and more sales per length of time than I was seeing before the promotion, it isn't really that exciting. What is much more interesting, though, is the Kindle Unlimited activity. I had about 16,000 page reads (about 37 book reads) between May and June, and only about 1,500 of those were before the sale. About 5,500 were during the sale, leaving about ~9,000 in the weeks after the sale's conclusion. That's about 23 copies of the book read since the sale is over, a little less than double the number of sales during that time period. But sales is one thing - what about the money? The cost of the promotional emails through the three companies ran about $75, so I needed to break that amount in order for this to have been worth it. Running the numbers, in the last 30 days, I've earned about $175 in sales, plus roughly $65 in Kindle Unlimited page read royalties (estimated), for a total of around $240. That means $165 in profit after deducting the cost of the promotion emails. Since I'm estimating my royalties for the prior twelve months at just about $130 (just under $11 a month), we're looking at a period of profitability roughly fourteen times higher than usual. So, was the promotion a success? In terms of sales and royalties, it certainly was successful. I sold twice as many books in the first day as I'd sold in the past year, and the money was certainly far better than usual. 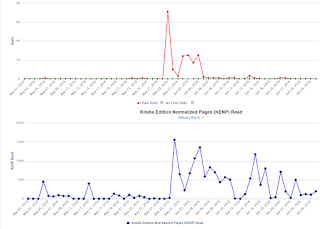 What's more, looking at that Kindle Unlimited chart, I'm going to guess that a lot of folks who saw the promotional emails decided to add the book to their KU reading queues, and they've been reading the book over the last few weeks, a trend which will probably continue for some time. As for regular sales, I think I'm going to take the price down, probably to $3.99, at least for a few months. I think the new cover will help it sell better at a slightly lower, more attractive price point. I hope the above information is helpful for any authors out there who are considering the use of promotional email lists in getting visibility and sales for their titles. Good luck!